The following 16 bands have registered to perform at the 2019 Puget Sound Festival of Bands. They are listed in alphabetical order, not in the order of performance. 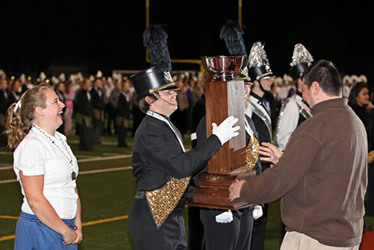 At the conclusion of the preliminary competition an awards ceremony will be held in which trophies will be presented to the top three bands in each division. Preliminary competition caption award plaques for each division will also be presented during this time. A total of 16 bands will complete in finals competition. Each of the 1st Place winners in each class are selected for finals. The remaining finalists are selected based on their score, regardless of classification. The bands will perform in reverse score order. This year's judges have been selected based upon their competence and integrity, and are recruited at the local, regional, and national levels. The judges will provide each band with a commentary on a digital voice recorder for preliminary and finals competition. Commentary will be of a constructive nature that will help reinforce the learning process. The Cascade High School Band & Color Guard Boosters would like to thank all the individuals who help put together this show each year and their continued support. This help and support is what allows the festival to run smoothly. Please email PSFOBchair@gmail.com with any questions regarding this year's show.